At Big Bulls Head you can enjoy a range of tasty homecooked British dishes including all day breakfasts and steak. Do you work at Big Bulls Head? What did you think of Big Bulls Head? I really enjoyed my meal here, wouldn't really reccommend it for a big night out but a good place to have a few drinks and relax. So why did you give it 3 stars ?? 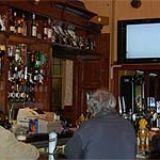 Nice little pub with a friendly atmosphere, food was nice its just that I asked for beans on toast with a fried egg but ended up gettin sum leek soup and a bowl of onion rings, £8:20 n all. Wounded! Fill your boots with booze and then head upstairs to one of the bedrooms at the Big Bull’s Head. In the morning you’ll even get brekkie to help with your hangover. On the corner of Digbeth High Street and Milk Street, The Big Bull’s Head is a two-room pub which also serves as a B'n'B. It’s pure Victoriana with its leaded, stained glass windows and indoors there’s a dark wood panelled central bar and a dark pink ceiling, which looks better than it sounds, that has ornate gold cornicing around the edges and glimmering chandeliers hanging from it. The floor is wooden and the windows are framed with yellow curtains. There are small tables and chairs all around the outside of the bar leaving plenty of space for standing as well as for the purple baize pool table in the middle. The walls are cream coloured and there’s a burgundy banquette running all the way around the outside of the room. 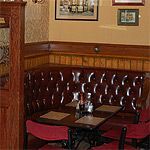 There’s a separate room too the other side of the bar which is set out for dining with the menu on the placemats. It’s a friendly mix here - plenty of locals and regulars, as well as people coming for a meal. Sunday lunch here is particularly popular. It’s fair to say it’s a more mature crowd with plenty for over 40- and 50-year-olds but lads do come in for a game of pool and a pint before moving on to other pubs to go on the pull. 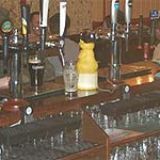 On draught there’s no shortage of choice with Ansell’s Mild, Strongbow, Guinness Red, Guinness Extra Cold and Red, Carlsberg, Heineken, Blackthorn, Guinness, Carling, Worthington’s and Brew XI. On the food side of things you can get a Top Of The Morning breakfast from Ma McGrath’s Kitchen for £3.95, as well as sandwiches for around £2.50 each, scampi and chips for £4.95 and it’s £6.95 for Sunday lunch. A bit of a local celebrity, this particular star shows no sign of waning.